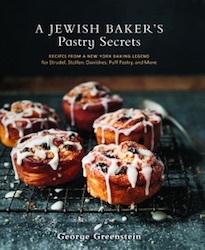 The subtitle of George Greenstein’s A Jewish Baker’s Pastry Secrets is Recipes from a New York Baking Legend for Strudel, Stollen, Danishes, Puff Pastry, and More . The title page adds “with Elaine Greenstein, Julia Greenstein and Isaac Bleicher” to the name of George Greenstein. This is more than a cook book, or culinary arts manual; this is the story of a family of multi-generational bakers, of kids who grew up to be bakers, of a bakery that was part of a community. George Greenstein, the eponymous Jewish baker, is the same Jewish baker who authored Secrets of A Jewish Baker (The Crossing Press, 1993; James Beard Award 1994; second edition Ten Speed Press 2007) decades ago, about when I first started to bake bread seriously. Mr. Greenstein, who wrote his first book after twenty years of running a local bakery in Long Island, died before he could finish this book, so his daughters and his grandson Isaac stepped in when they found George Greenstein’s manuscript. There’s a lot to love about this book, but one of the best parts is the attitude towards pastries and breads; they are meant to be shared, and making them is both a joy and an art. The one thing I kept finding myself wishing for were a few photographs; there are a few recipes (Apple ’n’ Cheese Cuts for instance) that would benefit from a photograph of a finished pastry. Were I one of the authors, I’d create a Tumblr or small website featuring images of the various recipes.